We will start our exploration with the understanding of the quantum spin states (also called the magnetic states) of these adsorbates. To measure these states, we combined scanning tunneling with x-ray absorption spectroscopy and found amazing agreement of those vastly different techniques (Science2014,PRL2015). Finally, we will explore the superposition of quantum states which is inherent to spin resonance techniques. 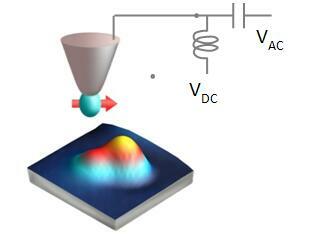 We recently demonstrated the use of electron spin resonance on single Fe atoms on MgO (Science2015). This technique combines the power of STM of atomic-scale spectroscopy with the unprecedented energy resolution of spin resonance techniques, which is about 10,000 times better than normal spectroscopy. Prof. Heinrich is a world-leading researcher in the field of quantum measurements on the atomic-scale in solids. He pioneered spin excitation and single-atom spin resonance spectroscopy with scanning tunneling microscopes – methods that have provided high-resolution access to the quantum states of atoms and nanostructures on surfaces. He is fascinated by the world of atoms and nanostructures, built with atomic-scale precision, and educates the public on nanoscience as demonstrated by the 2013 release of the movie “A Boy and his Atom”. A native of Germany, Prof. Heinrich received his PhD in 1998 from the University of Göttingen and then joined the research group of Dr. Donald Eigler’s as a postdoc. He spent 18 years in IBM Research, which uniquely positioned him to bridge the needs of industrial research and the academic world. He became a distinguished professor of Ewha Womans University in August 2016 and started the Center for Quantum Nanoscience (QNS) of the Institute for Basic Science (IBS) as the Director in January 2017.